TrueFoil 1-Pound Cannabis Storage Bag. Keeps your weed fresh, and ready for sale. Our high quality opaque silver metalized Mylar bag and stand up pouch make great display packaging and of the highest quality. Pouches come with a great top lip for heat sealing, and feature multilayer construction making it durable, smell proof, and moisture controlled. Extra Space: Unlike competitors 12×16.02×6 bags (made in china by the way) we give you a full size wit plenty of head room. Smell Proof — We design all our bags to have the highest smell proofing available. Easy to Heat Seal — A generous top lip on this 1-pound barrier bag gives you extra space to properly heat seal the bag. Your customer will also have plenty of plastic to grab on to when resealing it later. Tamper Evident — Once you have heat sealed it, if anyone opens it you will know. Durable – Unlike our competitor’s bags, our barrier bags feature a rugged multi-layer construction. The durability of these pouches also gives this mylar weed bag a high quality feel. Re-closable Zipper – Able to be sealed without a heat sealer, and re-sealed over and over. 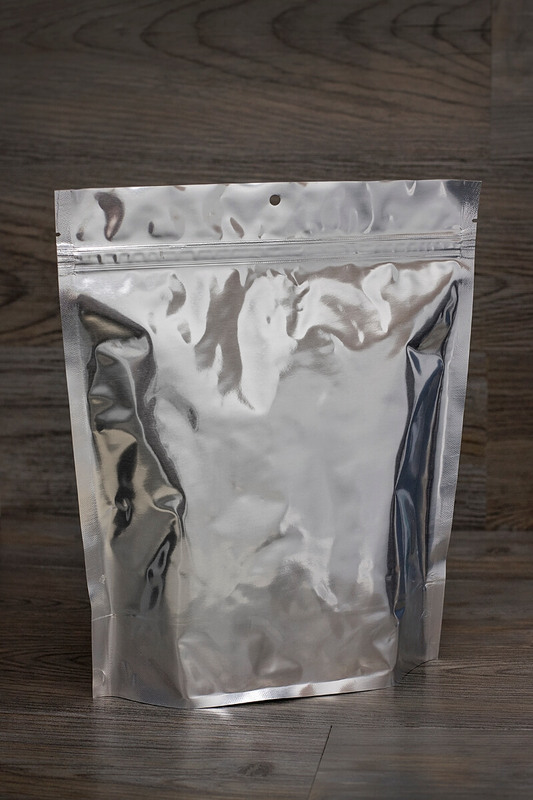 Extended Shelf Life — These silver barrier bags reduce oxygen and moisture vapor transmission which helps to extend the shelf life for a variety of products. See below for more specifications. Your customers don’t want stale, tasteless, or moldy food. Our Mercury Silver Mylar Smell Proof Bags and pouches feature the same industry leading Moisture Control Technology as our other products. Each of our bags are constructed with a specific combination of FDA approved food grade materials that are engineered to control both oxygen and moisture within the bag. This bag will keep your edible product fresh and tasty longer. You will also experience much increased shelf life. Feel free to contact us for precise data on the oxygen and moisture transmission features of our products including OTR and MVTR data. Need Printed Mercury Silver 1 pound marijuana packaging? The cost of Silver 1 pound marijuana packaging (14x17x6) resealable ziplock bags is dependent on a few factors. So, to get an accurate quote just give us a call at 626-376-9836 or contact us. Do you offer this Silver 1 pound marijuana packaging with a child resistant zipper? We offer a selection of stock child resistant bags, as well as customized child resistant Silver 1 pound marijuana packaging. Do you offer samples of Silver 1 pound marijuana packaging?